This recipe requires a double-batch of my Simple White Sauce. If desired, serve with Spanish rice, which is brown or white rice combined with sauteed onions, garlic, peppers, tomatoes, and more. Add avocados to the finished product for flair! The white sauce can also be used to make Family-Friendly Chicken Curry Over Rice and Homestyle Chicken Potpie. Optional garnishes: diced tomatos, sliced olives, chopped green onions (scallions); avocados. Make the double batch of white sauce, according to the recipe (above) for Simple White Sauce, and set aside. Saute the onions in the olive oil for 3-5 minutes. Remove onions from heat and add to the white sauce along with the cumin, chilies, and chili sauce. Reserve 1/3 of the white sauce and set aside. To the remaining white sauce, stir in 1 cup cheese and the chopped chicken. Coat a 9X13 pan or dish with nonstick cooking spray. Spread a few spoonfuls of the reserved sauce on the bottom of the pan. Using one tortilla, spread ¾ cup of chicken sauce on tortilla and then roll up. Place the rolled tortilla in the prepared pan. Repeat for remaining tortillas or until pan is filled. 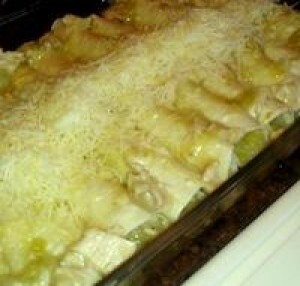 Spread the reserved white sauce over the enchiladas. Cover with foil. Remove from oven and top with extra mozzarella. If desired, garnish with diced tomato, sliced olives, and/or chopped green onions. Serve with Spanish Rice if desired.